Set like a crown jewel amidst Fiji’s 300 islands is Taveuni, the country’s third largest island after Vanua Levu and Viti Levu. Located in Fiji’s northern division, only a 1 hour flight from Suva or 80 minutes from Nadi, this volcanic island is known as the “Garden Island” for its abundance of flora. Taveuni is a beautiful paradise of tropical rainforests, farms and gardens and is famous for its jungle treks, spectacular waterfalls and world class diving. The underwater world in the Somosomo Strait which runs between Taveuni and Vanua Levu provides sheer evidence of why Fiji is deservedly known as the “Soft Coral Capital of the World”. Divers from around the world flock to Taveuni to dive Rainbow Reef and the Great White Wall, witnessing some of the most colourful and proliferate soft coral blooms as they open and expand to feed on the passing nutrients flowing past in the burgeoning currents of the Somosomo Strait. Pelagics such as barracudas, reef sharks and manta rays also feed in these nutrient rich waters. The island of Taveuni is the top of a massive, dormant shield volcano rising from the Pacific Ocean floor. Taveuni lies 6.5 kilometres to the east of Vanua Levu across the Somosomo Strait at the northern end of the Koro Sea. 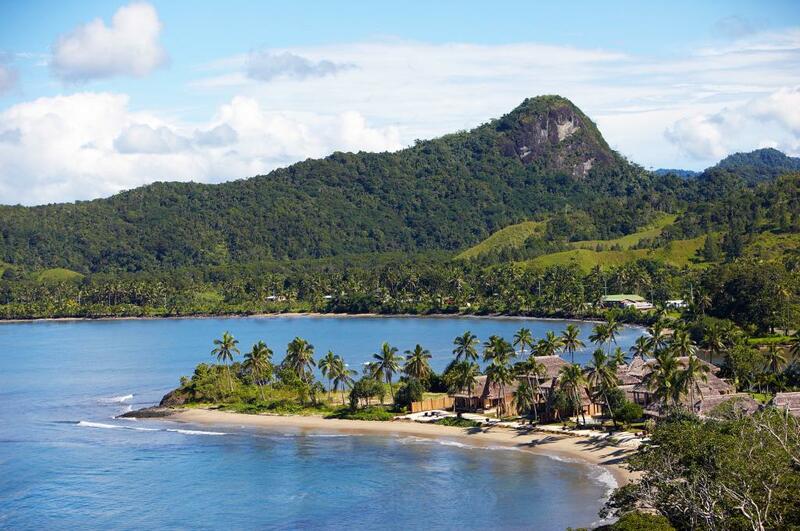 Much of Taveuni’s coastline is rugged and set against some of Fiji’s highest volcanic peaks. The cloud shrouded Mt Uluiqalau, at 1,241 metres, is the country’s second highest summit and Des Voeux Peak reaches up 1,195 metres, both offering some of the best views in Fiji. The volcanic soil and high rainfall makes Taveuni one of Fiji’s most fertile areas supporting the country’s agriculture industry. Black lava rocks flow from the island into the lagoon on the island’s South Cape. Here the geysers from the Matamaiqi blowhole come crashing down onto the volcanic rocks. 60 percent of the land is protected National Park. The Bouma National Heritage Park protects nearly a third of the island’s rainforest and coastal forest including three Tavoro Waterfalls. Lake Tagimaucia is a volcanic crater lake sitting at an altitude of 800 metres, and is the habitat of the rare tagimaucia flower (Flower of Love). Several reef systems surround Taveuni making it a diver’s delight. The north-east of Taveuni is fringed by reefs, the south-west has deep water close to shore. Visitors come to Taveuni to enjoy its relaxed atmosphere and to experience the natural beauty of the South Pacific - from the coastal walks along sandy beaches, to world-class diving and snorkeling just offshore, luxurious vegetation, pristine tropical rainforests with exotic birds, colorful Fijian and Indo-Fijian villages, and hidden waterfalls. - The Lavena Coastal Walk : a 5 kilometre path (3 hour return hike) leading through the gardens of picturesque Lavena village and along the pristine coastline past a suspension bridge to a tropical waterfall. - Vuna Village : an old village site near the southern end of the island that played an important role in the early European settlement of the island. Plantations and homes were purchased from the local chief, Tui Vuna. Diving is conducted year round in Taveuni. May to September provides the best visibility (20 – 40 metres) and lower rainfall. However, this is also the winter season when the days and the water temperature (24˚C - 26˚C) are a little cooler and the wind can pick up making surface conditions a little choppy. October to February provides warmer water, a little lower visibility and more rain. January to March tends to see the most rainfall. During these summer months water temperature can reach a very pleasant 30°C and visibility can be between 15 – 30 metres. Cyclone season is November to April. It is best to dive the Great White Wall when the soft corals are blooming. This will depend on having favourable currents which coincide with certain phases in the moons orbit and tide times in the Somosomo Strait. Please enquire about Great White Wall Schedule Dates for your travel period. Manta rays may be sighted seasonally from December to May. Turtles are best seen from October to April, and there may be possible sightings of humpback whales from July to September around Taveuni. Taveuni is home to some of the world’s most remarkable diving. Whilst known as the garden isle of Fiji for it’s rich flora above the water, the name could easily be synonymous with the healthy, colourful scenery found underwater. Taveuni is the reason for Fiji earning its reputation as “The Soft Coral Capital of the World”. Enthusiastic divers will marvel at the famously beautiful soft coral dives of the Great White Wall and Rainbow Reef in the nutrient rich waters of the Somosomo Strait between the western side of Taveuni and the island of Vanua Levu. Currents can be expected during these soft coral dives, and are required to showcase the abundance of the colourful soft corals in the area. The water movement causes the corals to expand to their finest and most prolific state. The horseshoe shaped Vuna Reef lies off the south-western end of Taveuni and offers divers a variety of diving. On the exposed southern side of the reef, larger pelagic and schooling fish can be found whilst the protected western part of the reef features soft and hard coral gardens and a big array of tropical reef fish. Just off the north of Taveuni lie the smaller islands of Qamea and Matangi with their own surrounding reef systems.